Today I’m going to share this little tool I made to test things in multiplayer environment. It is a simple GUI that allows to execute code on the client, on the server and also output a server hint on the client so that one can monitor some server values with ease. 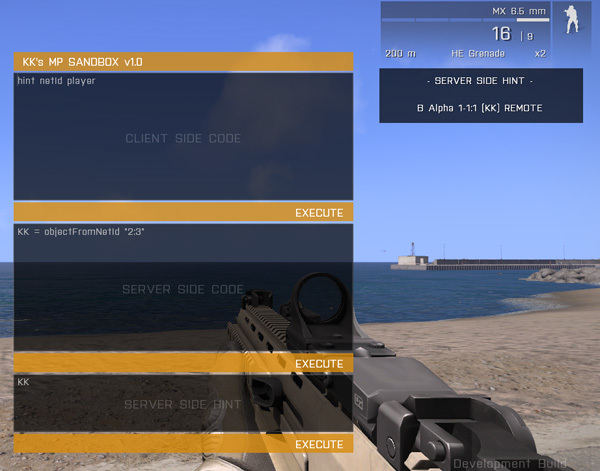 BTW, there is already an option to have inbuilt ArmA 3 debug console available in MP by adding enableDebugConsole=2; in description.ext if you prefer it. As an example (above) I took my player’s netId on the client then used objectFromNetId command on the server to get the reference to my player’s object then used server side hint to output the resulting variable. As you can see on the server my player’s object is classified as REMOTE as it should be. Open your description.ext file (make one if you don’t have it) and paste this at the very top: #include "KKSB\KKSB.ext"
Open your init.sqf file (make one if you don’t have it) and paste this at the very top: #include "KKSB\KKSB.sqf"
EDIT: Sandbox has been updated to v2.0 and includes ZEUS Interface. What is that you want gear menu do? I am trying to have it that if left click a item. It will show a action. Like in dayz. Where items have a custom class ItemActions. Here is some code for you. 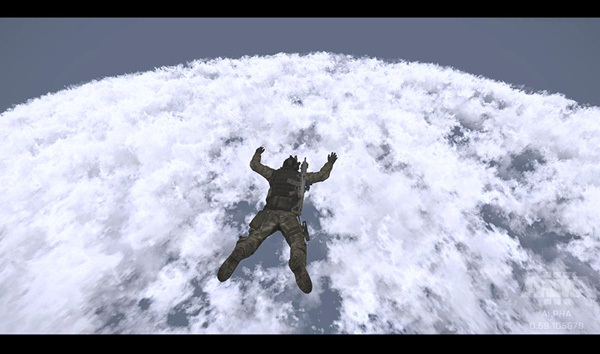 Execute it in Arma 3 debug console, then open gear. When you click on gear icons you will have a hint showing control. This should get you started. Thanks for the example. , Can i add you on steam? Sent a request. but yer the thing im mostly stuck at is why i cant modify RscTitles? Because the actual items are controlled by Rsc i believe. You know, When for example it highlights when you click the item. With A3 it would be easier to make own gear menu than to port over A2 functionality. Some commands like gearslotdata and such do not work in A3. Not sure if something changed but this looks pretty ugly in the current version of Arma 3. The input boxes are completely white. To fix this and make it look like the example photo again open KKSB.ext and find “class BoxClient”. The setting under that called “colorBackground” should be all zeros instead of ones. The menu works great. I’m using it for a local development server of Arma 3 Epoch since the devs disable the default debug menu execute buttons from working.